Karey White: Birthday Report - A success! Birthday Report - A success! As I mentioned a few days ago, I've wanted to do this for more than a year and got thwarted last year by monster kidney stones. Well this year the kidney stones stayed away and after a long day (and part of last evening), we are finished. Today I turned 49 years old. To commemorate each of those years I've been blessed with, I wanted to do an act of kindness. The greatest thing about today was... well, just about everything. We decided to get a jump on things last night. 49 is a lot of things to do and I felt good getting a head start. Travis received a gift certificate to Red Lobster for Father's Day and he wanted to use it Monday night, so we took the youngest two kids out to dinner. This is where it began. 1) We surprised a couple with an appetizer. We later discovered that our waitress and the waiter for the people we surprised were engaged. He had great taste in rings and they obviously had great taste in people because they were an adorable couple and the ring he'd picked out was stunning--a simple, square, pale green diamond. He came over and thanked us for surprising his guests and called his fiance a peach. I thought that was pretty cute. 2) We gave a $5 Cold Stone Card to a young mother and her little boy. 3) We taped exact change on a washer at the laundromat. 5) Left exact change at a carwash. 6) Bought a newspaper for someone. 7) The entrance to beautiful Alpine Loop is just about 1/2 mile from our house. We started the day today by driving up to the toll booth and paying for a car to be able to enter the canyon. 8) We had a carwash certificate for a full-service carwash so we pulled into the parking lot and then when a car pulled in, we hurried in front of them and gave the certificate before leaving. I'm sure at first they were annoyed and thought we'd butted in line. When they didn't have to pay, though, they smiled and waved. 9) Savannah, Joe and I went into the dollar store and paid for a woman's purchases. 10) We gave a movie gift certificate to a woman who was going into the theater with her three children. 11) We purchased donuts and took them to my brother, Mark's office. 12) We purchased breakfast for a man in a wheelchair who was sitting on the corner by McDonalds. He was in really bad shape and it was quite sad. 13) We purchased 15 breakfast sandwiches and delivered them to the homeless in Pioneer Park. We ran out and had a hungry man hoping for one so I told him we'd be back shortly. 14) We came back with 20 hamburgers and chicken sandwiches and handed them out to the homeless in Pioneer Park, including the man we'd missed the first time. 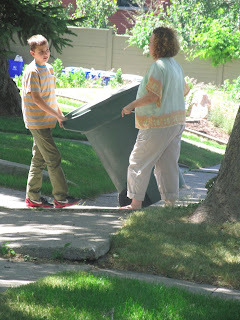 15) We moved peoples' trash cans in after their trash was picked up. 16) We went to the cemetery and cleaned four graves, cutting away the overgrown grass and leaves. 17) We left flags and patriotic pinwheels on six graves including my brother-in-law's grave. 18)We pulled fallen branches off several other graves. 19) We gave a $5 Cold Stone gift certificate to another mother with her two children. 20) We gave some money to a couple who needed to buy bus tickets. 21) We gave a couple of dollars to a man on the corner asking for help. 22) Cleaned up after lunch. 24) The kids played guitar and sang some of the songs they've been working on for their grandparents. 25) We gave bus tokens my dad had donated to the cause to a man at the bus stop. 26) We dropped off donations at Deseret Industries. 27)We found a boy selling lemonade on the corner and bought from him, leaving him with a nice, big tip. 29)We purchased cold water bottles and delivered 4 of them to a hot, hardworking road crew. 30) We gave a cold water to a homeless man. 31) Called a friend I haven't talked to in a long time. 32) Went to a little petting zoo and fed the animals (this was a kind deed from me to Travis, Savannah and Joe, who were good sports all day and LOVE little petting zoos. They loved this. 33) Taped $2.00 worth of quarters on the little feeder machine so others will be able to feed the animals. 34) We gathered and brought in carts at Costco. 35) Found a woman with a heavily loaded cart and helped her unload it into her car. 36) Found two women (one pregnant) with a little boy and two huge carts. They'd just purchased the food for Youth Conference and with Travis's excellent packing skills we were able to help them fit it all in their car. A little sidenote here: One of the women looked familiar, so I asked her if she was a Fields. She said yes and we discovered that I had recognized her from Facebook and she is the wife of a guy I knew on my mission. 38) Purchased a tie and dropped it off to a young man in our ward who is about to leave on his mission. 39) Loaded groceries into the car of an elderly woman at the grocery store. 40) Taped the exact change onto a vending machine at the mall. 41) Taped the exact change to the vacuum at the car wash.
42) Let a mother with three small children go in front of us in the checkout line. 46) Paid for the woman's dinner behind us when we got burritos on our way home. Wait, weren't we supposed to do 49? Yes, we were. And we tried. And if you count each of the people we took food to and each of the people we gave water to as individuals instead of just as one event, we'd be way over the top. I feel good calling it a success. I want to share a few things with you about this day. First, it was amazing. EVERYONE was so grateful and kind. When I told people it was my birthday and we wanted to share the fun, they were enthusiastic in their birthday wishes. I felt an outpouring of love for the people we were serving. My kids thought handing out food to the homeless was the best part of the day and left there feeling very grateful for our blessings. Second, I'm a very blessed lady. I have a family who energetically spent the entire day looking for opportunities to serve and carrying them out. There wasn't a single complaint. They were happy and cheerful the entire time. My good husband took the day off work only to work hard fulfilling my birthday wish. I'm so grateful. Third, I was surprised at the number of homeless or needy people in Salt Lake. They were everywhere. The 35 sandwiches we delivered were depleted so fast. There were so many lonely people, it was heartbreaking. Others had banded together and were looking out for each other. A few asked for a sandwich for their friend who was "right over there." We gave them the extra sandwich each time, thinking maybe they were just really hungry, but not begrudging it. And then we'd look back and they'd be handing it to their friend who really had been just over there. We saw people who were clearly in bad health. They were hungry. They had almost nothing. One woman had been beaten so badly the whole side of her face was a swollen angry bruise and you couldn't see her eye. It was awful. But then we handed each of them a sandwich and they smiled and offered appreciation and asked that God bless us for our kindness. It was very humbling. Fourth, serving makes us feel good. This isn't news to any of you, but I have to tell you, we came home exhausted, hot, and with tired feet. But we came home feeling happy about the day. Fifth is the conclusion we came to as we drove home. Today was a big day. We did a lot. For 12 hours we did nothing but look for things to do for others and carry them out. But nothing we did today couldn't be done in small doses on other days. It wouldn't be a hard thing to go buy a couple of breakfast sandwiches and take them to someone who's hungry. 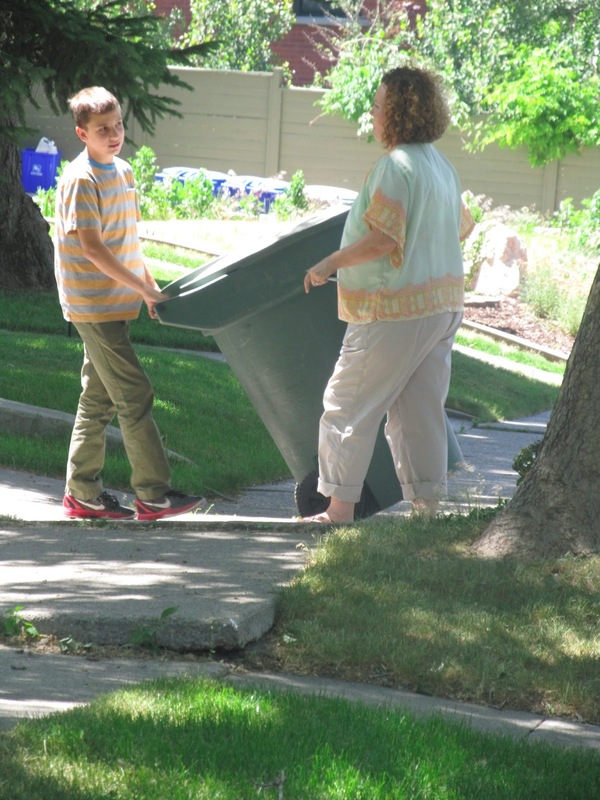 By itself, it's an easy thing to pull someone's garbage can off the street. A few cold water bottles to people working out in the heat isn't a great sacrifice or a hardship. Twenty minutes at the cemetery can easily clean off the headstone of someone's loved one. A phone call to a friend is easy. A thank you note to someone who's done something kind for you only takes a few minutes. I can do better at all these things on a regular basis. And finally... Thank you, thank you, thank you, to all those who joined me in this day of thinking of others. I'm honored. Truly I am. I have friends and family who cared for sick relatives and friends who cared for relatives who were taking care of sick relatives. Some fed missionaries, took treats to neighbors, made pies to take to firemen. Some paid for people's meals in line, bought groceries for someone in need and helped others pack boxes for a move. Some babysat for neighbors, took friends' children to the park and took in dinner. Some did it themselves and some enlisted the help of their children. There may be others who report what they did in the comments. For all these kind things, thank you. I'm so touched and grateful for all the wonderful things that were done today. I'm also thankful for all the kind emails, messages on facebook and twitter, cards and phone calls to wish me a happy birthday. This really has been the best birthday I can remember. Thanks for being a part of it. 47. Wrote an inspiring blog post that touched my heart and made me cry. 48. Encouraged others to do acts of service, thereby blessing their lives and the lives of those they served. 49. Wrote personal notes to those on facebook who wished you a happy birthday. What a brilliant idea--I think I'd look forward to my birthdays a lot more if I had this kind of attitude about all of them. What an inspiration you are! Torrie, it was the best birthday! I highly recommend it. ANd you're way younger than me. Do it sooner than later. called my MIL who has been sick to see if she needed anything. gave reflexology/neti pot tips to SIL who has been very sick and is supposed to leave for trek. took my kids swimming and swam with them and even did 3 dives for them. (that is a major one!). and other than that i cared for my family and spent most of the time thinking about myself. :( happy birthday. this was very inspirational and i want to live like this. maybe me & the kids will make this a summer goal with each of us doing one conscious act per day. love you! Sounds like you had a good day. And you swimming with your kids (and diving for them) was kinda like me going to a petting zoo since I hate petting zoos. Almost. I guess if I'd been as good as you, I'd have petted the animals instead of just watching my family, right? Thanks for joining me Lisa. Love you, too. I made a more conscious effort with my home and family. I didn't go anywhere, call anyone, or do anything outside of my family but the extra effort on my family and home, paid off and felt good. Thank you!!! Happy birthday. thanks for visiting aaron's grave. that actually means a lot. you did forget one that i know of. you brought me a plant. you didn't mention that one, but it was appreciated. lisa and i actually started a private and secret blog several years ago that was for the two of us to report just to each other what random act of kindness we did each day. it was neat and fun while it lasted... too bad we didn't keep it up, but this posting makes me want to start again. glad it was a great day. i was glad to see you on your birthday. Thanks Karey! What a wonderful idea! I don't know if I did anything extra yesterday, but this morning in a store parking lot, I walked by a lady that was trying to load a bunch of balloons into the back of her car. I could just hear her frustration, and then thought about you. I turned around and went back and helped her keep the naughty balloons in her car and helped her unload her groceries. Thanks for the great example! Your service to the people in Salt Lake especially touched me. I'm always hoping that when my daughter is in situations like that that there will be angels watching over her. Thank you. Awesome! Seriously... what an awesome thing to do! My Birthday -- Give Me Presents!